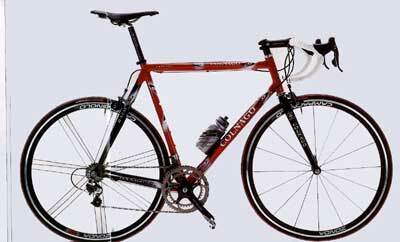 Is it wrong for Colnago to produce a race bike for the masses? Mike Hawkins tests the cut-price (although still £1200) Colnago Dream B-Stay, and Campagnolo's latest version of Record - Ultra Having ridden the Colnago C50 and the Trek Madone before testing the Dream, I was honestly expecting to find the Dream to be somewhat lacking in excitement. After all, both the Madone and the C50 are pinnacles of their respective ranges and the Dream B-Stay has been around for a few years - in fact the model we're testing is the 2003 incarnation. Don't worry, we aren't testing an out-of-date model, the 2003 Dream will be available for this season. For 2004 the Dream has become the Dream HP and will cost £1499. It gains a 1 1/8" headset, along with the same High Power chainstays found on the C40HP. Construction of the frame is made with Columbus renowned Airplane tubing, and at the rear carbon-fibre chainstays are used along with the carbon B-Stay. 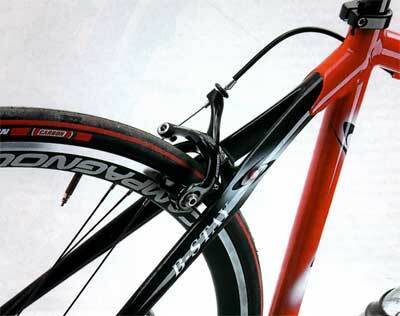 Colnago uses the same B-Stay throughout its range of bikes. 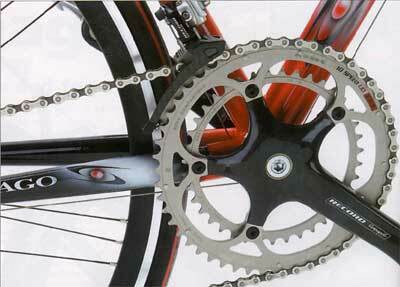 There are five versions to choose from depending on the frame size, so they are well tuned to a specific rider's dimensions and not a 'one size fits all' solution. Up front Colnago maintains its use of a one-inch headset and the fork of choice is the monocoque straight-bladed Colnago Force. Our 59cm test frame on its own weighed a respectable 1,157 grams. Heading out on the Dream, the stiffness of the frame doesn't immediately hit you. The bike feels crisp and quick when getting underway, but the stiffness is not the first thing one is struck by. Instead the frame just feels smooth. It's only once you start to power away from a junction or try to catch a break that you realise the level of stiffness that Colnago has built into the Dream. Quite cleverly the frame allows a small amount of deflection relatively easily, similar to many other aluminium frames, but when loaded up further there appears to be no additional flex. This results in a frame with some added zing to back the rider up when needed. It's a curious situation that makes it feel as though the bike is responding to the extra effort the rider is putting in and responding to your demands. This isn't the first bike I've found this with but it is quite rare. The easiest way to describe it is that the bike feels greater than the sum of its parts. Perhaps this is a strange concept. But I think it's down to the craftsmanship that has gone into the frame, something that anyone who's ridden a Colnago should know all about. The handling of Colnagos has never been in much doubt, so it'll come as little surprise that the Dream handled well. All manner of corners could be taken at top speed with minimal consideration given to the road conditions. Tilt the bike into the corners and there was instant feedback about the level of grip that the Vredestein tyres could yield. Much of the credit for this must go to the straight-bladed, one inch Force fork. With the edge of traction so well signposted it's possible to lean the bike over and really make the most of it. On the odd occasion when the amount of traction was less than anticipated, the bike really shone. The Dream builds so much confidence, it nearly led to catastrophe. On one occasion, on a greasy day on the way through Croydon's back roads on my way to 'CW Towers', I was riding out of a traffic junction, with far too much speed, when both wheels slid out from under me. With most bikes this would have resulted in a crash but, thanks to the well-balanced nature of the Dream, a fall was avoided. By the time I'd realised what was happening, I'd slid from one car tyre groove to the next and grip had returned, allowing me to stand the bike up again and continue as if it was intentional. The only minor flaw in the otherwise excellent handling was found at high speed. While descending with other riders at close to 50mph, the buffeting experienced from other bikes crossing my path had the tendency to upset the front end a little and made it feel somewhat lively. This was nowhere near as obvious as on some other bikes - Cannondale's CAAD7 for example - but clearly shows that Colnago has made the front end as lively as feasibly possible without having to sacrifice the overall package. For a bike that's been around for a couple of years the Dream is very modern in feel, no wonder it's still in the range. Colnago for the masses? The Dream is about as close as you'll ever get. It's definitely still a genuine Colnago with all that the name entails, and yet it is available for less than half the price of the C50. I'm amazed to confirm that the ride does compare with the C50. It's not quite as sophisticated or ultimately as comfortable, but also a lot less money. In all, it's a great frame that makes the brand more accessible than ever before. 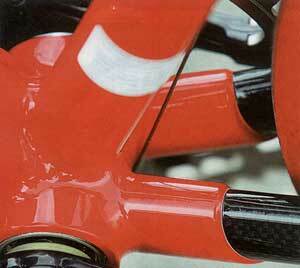 As with all Colnago bikes, the Dream came as a frameset alone and required building up. With the new Campagnolo Record Ultra groupset just realised it made sense to build the Dream with this and test the two together. Record Ultra has received several significant upgrades from last year, with most parts of the groupset overhauled in some way. Starting at the front, the Ergopower shifters look similar on the surface but for a small sticker on the upshifter. But internally Campagnolo has changed the weight of the shifting - it's now lighter. While this equates to an easier shift, it is barely noticeable until you are really tired; and honestly I'd be surprised if most riders can tell the difference. Campagnolo has introduced a new pair of brakes calipers too. Functionally the same, they are now available in black and the polished finish. They still have the superb modulation that we've come to expect of them. The Ultra front mech is pretty special to look at with its carbon outer plate. Interestingly, the spring for this has been detuned compared to previous versions, so that it now offers less resistance. The technology and impetus for this came from the electronic shift programme first seen last year and still in development. The softer spring meant that when really stamping on the pedals there was insufficient force to complete a downshift. On occasion this was slightly frustrating as it meant you were forced to ease up when downshifting. Of course, easing up when downshifting is good practice, but not always practical in a race situation. Gone are the old carbon cranks with their conventional 90-degree weave. They have been replaced by a set that looks as though the carbon has been marbled. This finish is part of the new manufacturing process that sees the use of multi-directional fibres - these are distributed in all directions so loads are better resisted. Conventional unidirectional carbon is still used because of its well documented strengths, but multi-directional carbon adds further strength. For all the improvement that Campagnolo speaks about - greater resistance to static load, fatigue and torsional loads - there was nothing perceptible on the road. They simply did the job. This same multi-directional carbon has been used on the rear mech cage but only on the medium and long cage versions; the short incorporates conventional fibres. The addition of a carbon plate on both the front and rear mechs certainly ties the two together much better and makes for a more harmonious groupset. Campagnolo's new Record Ultra may be the most expensive groupset available, but the changes have certainly moved it on another stage. Whether it still offers value for money is up to you to decide. The groupset as tested is priced at £1,457.90 including wheels. With the externally shaped and butted bi-conical tubes you could be wondering if it's all a load of guff, or whether Ernesto Colnago is really onto something. After all, if it was that good, everyone would have started to use them by now. But as ever in the world of cycling, it's not quite that simple. Sadly its not just a case of copying the tube shape - you need to know what to do with it. The bulging tube with longitudinal ribs, known as the Master tubeset, has been around for many years. Master was first seen as a steel tubeset more than 20 years ago and today continues to be produced as the Master X-Light. This Master shape was then modified for production in aluminium and first used in the 2001 Dream Plus tubeset. since search engines often catalogue individual pages, click here to experience the full effect.